What Is the Difference Between a Rough Green & Smooth Green Snake? Green snakes are North American snakes in the family Colubridae. Two species are recognized: The rough green snake (Opheodrys aestivus) and the smooth green snake (Opheodrys vernalis). Currently no subspecies of either species is recognized; historically, the two forms of the smooth green snake were considered different. Both snakes are small and thin; the smooth green snake reaches about 2 feet in length, and the rough green snake can grow up to a foot longer. While smooth green snakes are indeed smooth, rough green snakes are named for the raised keels found on the scales of the snakes’ dorsal and lateral sides. Rough green snakes have much larger eyes than smooth green snakes, which aids in identification. Rough green snakes are found throughout the southeastern United States, while smooth green snakes are found in scattered populations throughout the northeastern and midwestern United States as far west as the Rocky Mountains. Though some populations continue to thrive in the face of human development, both species have experienced drastic population declines because of habitat destruction and pesticide use; accordingly, they do not live in all parts of their historic ranges. Both species favor disturbed areas over mature forest, but the rough green snake is primarily arboreal, and the smooth green snake is primarily terrestrial. Both varieties of green snake are difficult to study in the wild because of their excellent camouflage, and only a few scientists have attempted numerical population studies. According to the limited data available, it appears that rough green snakes -- which inhabit warmer, more productive habitats with higher insect densities -- occur in higher densities, or greater populations, than smooth green snakes do. A 2006 report prepared for the USDA Forest Service by Alan J. Redder and colleagues cites two mid-20th century studies of the smooth green snake, which detailed densities of 44 to 74 snakes per acre. By contrast, Redder and company cite a 1997 study that documented a density of 295 rough green snakes per acre. Females of both species deposit five to 15 small, thin-shelled eggs in concealed locations. 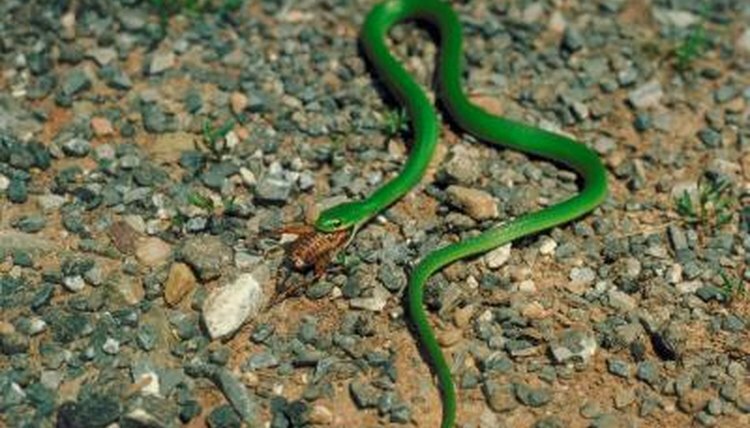 According to a 1988 study by Michael V. Plummer and published in "Copeia," rough green snakes select incubation sites based on moisture content. The timing of egg deposition differs slightly between the two species; smooth green snakes mate in the spring and deposit eggs sooner in the season than the rough green snakes, which don’t mate until early summer. Female smooth green snakes are known to retain their eggs internally so they can continue to bask, incubate the eggs that way. This is similar to ovoviviparous species, which retain the eggs until they are ready to hatch. What Shape Are Venomous Snakes' Eyes? What Characteristics Do Both Lizards & Snakes Have? What Is the Average Size Clutch of a Corn Snake? What Kind of Shelter Do King Cobras Live In? How Many Snakes Are Born at a Time?